My British publisher Gollancz are reducing the price of their digital e-Book editions debuts this year to £1.99 … for the first week of publication and on any pre-orders as well. 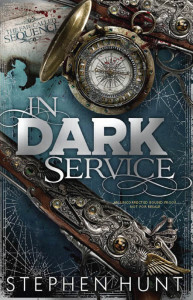 My next novel – the first in my new Far-Called series – ‘In Dark Service’ is one of those being included in their scheme. ‘In Dark Service’ is coming out 15th May 2014, and the e-book pre-orders for it are available on Amazon at http://amzn.to/1cF0pkN. So, if you decide to purchase the e-book at any time up to a week after it’s been published, you’ll do so for less money than a Saturday newspaper! Now that’s making your budget stretch a little further. There’s also a USA-link to the e-book at http://www.amazon.com/gp/product/B00IXTQ9QY/ – but as usual, Amazon is blocking half the details from my UK-based web connection. I’m currently awaiting news from Gollancz as to whether the e-book will be available at the low intro price in the USA too (or, indeed, at all). « Let’s talk about software.